To those who’ve never experienced what it is like to actually have asthma, it can be difficult to know just what it is like. 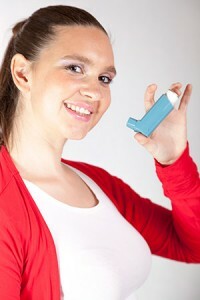 Simply put, an asthmatic person has difficulty breathing. This difficulty comes from inflamed or partially blocked airways, known as bronchial tubes, which bring air to and release air from a person’s lungs. An asthmatic person’s airways are in a constant state of inflammation, but certain triggers can make it worse, showing with symptoms like coughing, chest tightness, shortness of breath, or wheezing. Some triggers that lead to these more serious problems include upper respiratory infections (URIs), physical activity and allergies. In fact, there are certain kinds of asthma that only occur when exercising (known as exercise-induced bronchoconstriction). Imagine the feeling most people have after they finish a run or playing an intense sport. There is a period of time where it can be difficult to catch your breath and you must focus intensely on breathing. This is what everyday life can be like for an asthmatic. While there is no cure yet for this disease, there are many effective treatments options that help control the inflammation and symptoms. Speak with a member of our staff to learn about the treatments options that can help you live a productive, normal life.